Accepted Scientific Name: Sternbergia lutea (L.) Ker Gawl. ex Spreng. Syst. Veg. (ed. 16) [Sprengel] 7(2): 795. 1830 [Oct-Dec 1830] Spreng. 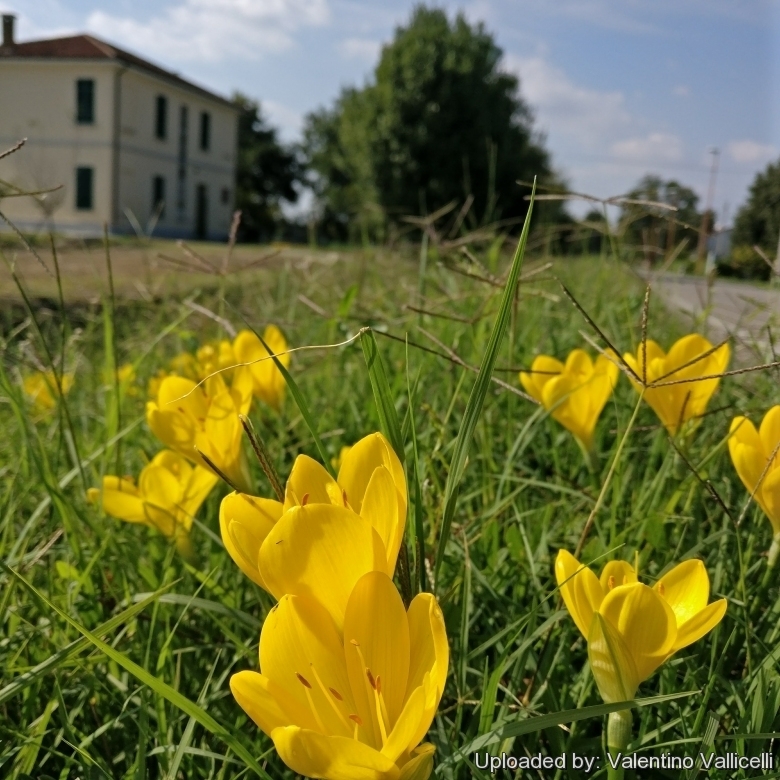 Sternbergia lutea is one of the oldest of cultivated flowers. Some historians believe that this plant is the “Lily of the Field” referred to in the Bible. 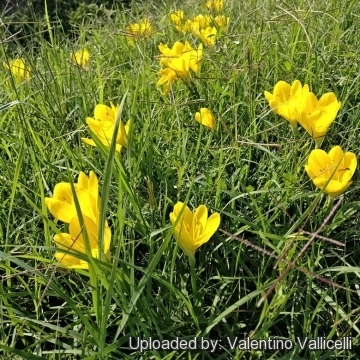 Origin and Habitat: Sternbergia lutea from the Balearic Islands in the Western Mediterranean Spain, through Italy, Sicily, ex Yugoslavia, Albania, Greece, ex URSS, Iran, Turkey, Israel and Iraq, through to Tajikistan in Central Asia. It is also present in Nort Africa (Tunisia, Algeria and Morocco). Altitude range: 200-1000 metres above sea level. Habitat: Grasslands, screes and open wood margins, on rocky (generally calcareous) substrates. This species is widespread as native species and often also as cultivated ornamental. Sternbergia lutea (L.) Ker Gawl. ex Spreng. Sternbergia lutea var. sicula (Tineo ex Gussone) K.Richt. Oporanthus siculus (Tineo ex Gussone) Parl. 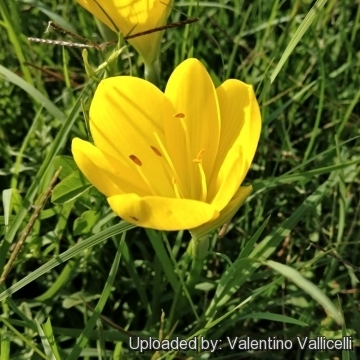 Description: Autumn Daffodils (Sternbergia lutea) are charming Autumn-flowering bulb that are often mistaken for crocuses, but they have six stamens, which preclude all possibility of their being members of the iris family (Iridaceae), to which crocuses belong. Flowers of the iris family have only three stamens. Stembergias belong to the family Amaryllidaceae, subfamily Amaryllidoideae. Unlike crocuses, which have solid bulb-like organs called corms, stembergias have true bulbs formed, like onions, with con-centric layers. In autumn S. lutea sends up dark green, slender, strap-shaped leaves. From the centre of these, one or more rich golden chalices, 4-5 cm long are produced. These blooms are of firm substance and remain decorative for a long time. Leaves: Up to 9, linear or narrowly-strap-shaped, keeled, rounded at apex, with papillose margins, glossy green, (8-)15-20(-30) cm long and up to 1-2 cm wide. Leaves first appear in the autumn (September to November in its native habitats), stay all winter, and die in late spring. Flowers: 1-3 on a 5-20 cm long and solid scape or stalk. Flowers erect, funnel shaped, usually solitary, deep yellow emerging from a green spathe and appearing soon after the leaves. The blooms have perianth tubes that broaden above into six equal, lanceolate or obovate tepals rounded at apex or shortly mucronate, around 3–7 cm long and 1-2 cm wide. There are six yellow stamens with filaments conniving and inserted at equal height in the tube. The style is slender and tipped with a single tri-lobed stigma. All parts: the six grey-striated tepals, the six yellow stamens with its anthers, and the style with its stigma are yellow. Fruits: Fleshy capsules 1.5-2.5 × 1-1.5 cm. Chromosome number: 2n = 22 (33). Typically, cultivated plants are triploid and natural populations are diploid. 5) Evans, Erv & De Hertough, A.A., “Sternbergia lutea; Winter daffodil, Fall daffodil, Yellow Autumn crocus”, NC State University, <http://www.webcitation.org/61pzU2TuA>retrieved 2 Oct. 2016. 6) Wikipedia contributors. "Sternbergia lutea." Wikipedia, The Free Encyclopedia. Wikipedia, The Free Encyclopedia, 12 Sep. 2016. Web. 2 Oct. 2016. 8) Morales R., Castillo J., 2005. El género “Sternbergia (Amaryllidaceae) en la Península Ibérica.c An. Jard. Bot. Madrid 61 (2): 119-128. 8) Morales R., Castillo J., 2005. El género “Sternbergia (Amaryllidaceae) en la Península Ibérica.” An. Jard. Bot. Madrid 61 (2): 119-128. Cultivation and Propagation: Sternbergia lutea is a perennial, summer deciduous plant and used as ornamentalt. It can can grow in mediterranean or temperate climate. Soil. This species grows best in and deep, nutritious soil that tends to be dryish rather than wet. Alkaline soils are recommended. Light requirements: Sternbergias need sun or light, part-day shade. Warning: The bulbs of S. lute are poisonous if eaten. Propagation: By offsets, bulb cuttings, and seed. Bulbs are usually planted while dormant (i.e. in late summer or early autumn), but can be lifted and divided before the leaves die down in late spring.Newly planted bulbs commonly take two or three years to become established. The bulbs are planted at depths of 10-15 cm, after making sure that beneath them is a deep layer of earth of a quality encouraging to roots.